(1 Day Instruction) – This class provides a general overview of the polyurea technology from the standpoint of history, chemistry, general safety, general processing characteristics and application use. 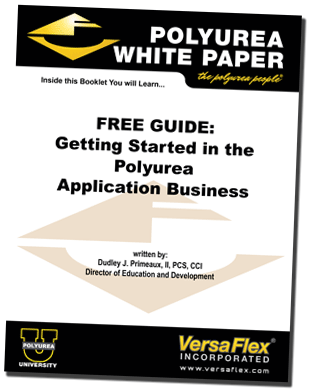 This course is not a product specific course, and applies to various polyurea technologies. Course participants include those new to (or thinking about getting into) the polyurea industry, those with some years of experience, students, engineers / architects for specification, facility owners / coating specifier and inspectors on polyurea application areas, equipment suppliers and sales personnel. This course is also designed as a pre-requisite to Class 3: Polyurea Spray Applicator. (2.5 Days Instruction) – This is the general applicator course / class. Included in class are discussions on the general types of polyurea systems, safety measures required for use of the system, application equipment characteristics for polyurea, including proportioning units and spray guns and how to optimize. This course also provides information on various substrate characterization, general surface preparation requirements, use of primers (when required) and option of topcoat requirements. This also includes both general equipment and application troubleshooting, processing troubleshooting, and applied testing. The course is a combination of classroom work, hands on testing and required spray application work. The importance of a Job Log Profile form is also presented. A Certificate of Completion will be provided to all attendees after completion and participation in the course and passing of the 50 question exam.